Reinforce, review, recapanywhere you like. Study for the three parts of the CIA Exam no matter where you are with each of the three Focus Notes volumes. 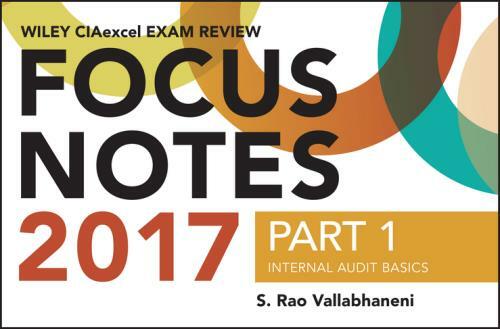 Wiley CIAexcel Exam Review 2017 Focus Notes reviews important strategies, basic skills, and conceptsso you can pass the CIA Exam your first time out. Its portable, spiral–bound, flashcard format helps you study on the go with hundreds of outlines, summarized concepts, and techniques designed to hone your CIA Exam knowledge. S. RAO VALLABHANENI is an educator, author, publisher, consultant, and practitioner in business with more than thirty years of management and teaching experience in auditing, accounting, manufacturing, and IT consulting in both public and private sectors. He is the author of more than sixty trade books, study guides, review guides, monographs, audit guides, and articles in auditing and IT. He holds twenty–four professional certifications in business management in Accounting, Auditing, Finance, Information Technology, Manufacturing, Quality, and Human Resource fields.